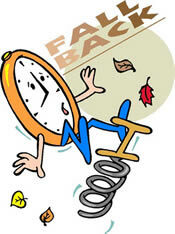 Think of this as a timely reminder as we set our clocks back and daylight savings time comes to an end. The cooler nights are already foretelling us of the even shorter days that will soon be thrust upon us. It is also a reminder of the natural rhythms of life: Two steps forward, one step back. We make progress with our diet, losing six pounds; shortly thereafter we put back on three pounds (or more!). We carefully save $500 but then spend $250 by splurging on a night out on the town. Our stock goes up two dollars in value, then retreats a dollar. Financial traders have a saying to describe this phenomenon: “The trend is your friend.” It is their way of reminding themselves to make sure they are going in the right direction. Imagine the difficulties we face when the opposite circumstances occur. We gain six pounds, and lose three. We spend $500 but only save $250. Our stock loses $2 in value, and gains back a dollar. If you spring back and fall forward, you will probably land flat on your face. If you do, pick yourself up, dust yourself off, and try again. We welcome you to learn more your financial life through our online community of people seeking financial independence.